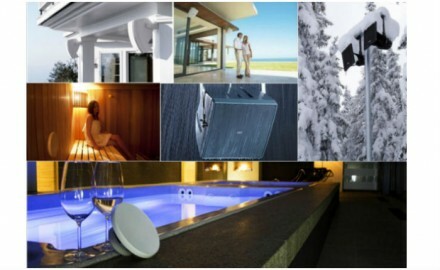 The waterproof speakers are created to resist, when they are installed in outodoor, to any climatic conditions. In professional enviromental installations, they often are used in big public areas as airports, rail stations, supermarkets, whatever the weather they can find. Under the summer's sun or under the rain, even under the snow they must work expecially when they have to spread sounds and security's messages. In professional installations they are also used in sporting and relax circles in swimming pools, saunas and gyms where over to the ambient humidity, other factors are added as cloro and sweat which make their job much more difficult. In domestic installations, with particulars design and many different colors the waterproof speakers are used in gardens, under the roofs and shelters, for to have a sound's diffusion where we want.